Many people who start consulting, freelancing or do some form of work from their home as a hobby that pays them or even working after retirement don’t realize that they ARE a small business. Are you a top independent field consultant for a network marketing firm (Herbalife, Shaklee, NuSkin), freelance programming or making money selling jewelry or art? Are you a retired executive who has started consulting? Are you a working professor getting paid for your expertise on the side or to speak at events? If you’re self-employed and making money, you ARE a small business. There are lots of advantages to being a small business. If things work out, you can make a lot more money. In addition, new technology tools simplify running your business, you have a flexible schedule, and you can be involved with something you’re passionate about. Another benefit is an opportunity for long-term savings: there are retirement plans specifically designed for small business. Here are some tech tools for the self-employed that will help you manage your work more effectively. According to Frugal Entrepreneur, contract management solutions such as DocuSign, SignNow, and Adobe EchoSign, help you store, track, and manage your contracts. If you need help organizing and taking notes, the Evernote app is a web-based app designed for just that – it archives text, images and video files. If you travel for sales, a mobile credit card reader app is a wise investment because it gives your customers more payment options. But no one is going take care of your retirement unless you set up a plan for yourself. Savings Incentive Match Plan for Employees (SIMPLE IRA). The SIMPLE IRA plan allows the owner to contribute the lesser of $12,500 salary or 100% of their pretax compensation to the plan. If the business owner is over age 50, he or she can make an additional $3,000 “catch up” contribution. Simplified Employee Pension Plan (SEP IRA). The SEP IRA allows business owners to contribute up to 25% of compensation. A business of any size, even one person self-employed, can establish a SEP. Maximum contributions are limited to $53,000 in 2015. Self-Employed 401(k) or Solo 401 (k) plan. The one-person 401(k) plan is a good option for people who have no employees and want the flexibility of making large optional contributions each year. The business owner may defer the lesser of $18,000 or 100% of compensation and make a discretionary Profit-sharing contribution up to 25% of compensation. If the business owner is over age 50, he or she can make an additional $6,000 “catch up” contribution bringing the maximum total contribution to $59,000 in 2015. Defined Benefit Plan. 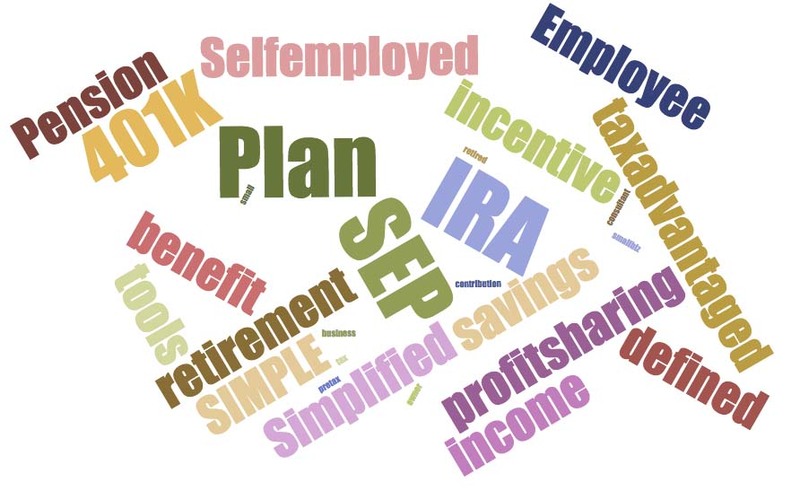 The defined benefit plan is designed specifically to meet the tax savings and retirement income needs of people who have high self-employment income. These plans allow the highest annual deductible contributions, averaging $100,000+. Business owners are required to make contributions for a minimum of 3-5 years. What are the benefits you’ve found being self-employed?